This book is in all respects a stunning accomplishment and important study both for European history and military science. But the title attached by the English language publisher is misleading, to say the least. The book is not about the "Birth of the Russian Empire" but about the death of the Swedish Empire. This is the author's theme and intent and it is no wonder the book has been a best seller in Sweden. Russia plays the part of the inert stage upon which the Swedish army plays out its destined role. The Russian army acts as some kind of Greek chorus decidedly in the background and only brought into the act by way of illuminating something about the Swedish forces. Peter Englund is entitled to select his own topic, which it turns out is especially timely now, in the era in which the Russian Empire along the Baltic has receded and Swedish influence is rapidly increasing. It is a sign of our times that, when the newly independent Estonians bought Swedish gunboats, they placed them on Lake Chud. The role of the Russian army in the "Birth of the Russian Empire" and the place of Poltava Battle and indeed the whole Great Northern War in that process is yet to be written. Sweden's hegemonic position in the Baltic region in 1700 was the result of the steady efforts of generations. Its collapse came in the space of a couple hours on a hot and dusty Ukrainian field. The author provides sufficient background on the early developments for the non-specialist reader without boring a Swedish audience that no doubt knows the history by heart. His gaze is focused on the climactic encounter from about 1 AM to noon on 28 June 1709, that was decided in the space of about 10 minutes around 10 AM. He set out to answer the question that must have been on all Swedish lips from the moment news first arrived, "How could it happen?" From his introduction and analysis of sources it seems the question is still, if not debated, at least the subject of much discussion. Along with information on a host of specific military matters, his answer to this and other broad aspects of Swedish culture are carefully integrated into the narrative of the campaign. Englund takes up the first question, "How was Sweden able to build an empire in the first place", explicitly in the course of narrating the campaign's preliminaries. He summarizes the successful wars and judges them, "Undeniably, this was a very impressive historical phenomenon." (p 30) He points out that, "Down the years, numerous historians have been attracted to the problem of accounting for Sweden's improbable expansion and several schools of thought have evolved." These he proceeds to explain and evaluate. His own view is that no single causal factor can have determined the result, but that, "Without a doubt, however, internal conditions in Sweden played an extremely important, even decisive, role as catalyst for the long succession of wars and the unparalleled expansion." (32) In the course of several pages he presents an excellent summary of the relationship of war to politics and culture. But all of this is only to prepare the reader who is wondering about the empire's loss. Having completed it, indeed reread the book several times, one realizes that Englund nowhere presents a parallel analytic examination of this, the central question of the book. The reader must come to his own realization from the detailed description of the army, its composition and ethos; its motivating ideology and practical ways of doing business; and above all its existence as a kind of anachronism in a changed world. The battle has been a source of fascination for all Europeans at least since Voltaire made it the subject of special study. Sir Edward Creasy included it in his Fifteen Decisive Battles. Fuller and Spaulding included it in their studies of the development of warfare. The battle receives attention in R. M. Hatton's fine biography, Charles XII of Sweden, and it naturally is described in all important biographies of Peter I. But there has never been a study of it like this one. The author provides an extensive bibliography and discussion of the categories of sources as well as of many individual reference works. From this it is clear that the subject is the internal essence and character of the Swedish Army at Poltava. The author's own academic research is revealed in the reference list, which includes his "The Carolinian Mentality, Ideology, Attitude and Myth in the Swedish Officer Corps 1700-1721", unpublished thesis, Historical Institute, Uppsala, 1982. His thorough grasp of the psychological aspects of warfare is evident throughout this book. He includes only a very tiny number of references relating to the Russian side, none of them original. The matter of sources is important due to the style of the narrative. It is almost as full of directly quoted conversations amongst the Swedes as a novel. He points out that the contemporary Swedish field army records were destroyed on the spot. However, many written letters, diaries, and reports were undoubtedly sent back prior to the battle. He indicates some 4,000 out of the 23,000 prisoners returned to Sweden and there were at least 1,300 who escaped with Charles to tell the tale. In keeping with the times, these folk were evidently inveterate writers. An author interested in the psychology of his subject obviously can't be limited to externally derived facts and figures. This is readily apparent from the table of contents. The entire background of the war and the campaign of 1708-9 up to the eve of battle occupy 80 pages. The single day of battle consumes 132 pages, and the retreat plus brief epilogue takes the remaining 40 pages. This then is the story of a powerful army, some 49,500 strong, and its total and final destruction in one of the world's decisive battles. "Decisive" has several meanings for various students of war. To some it refers to the onesidedness of the results at the tactical level. To others it means the ultimate impact of the outcome of the battle in changing the course of world history. This is one of the few battles that can be defined as "decisive" under both criteria. Although the author never used the phrases "fog of war", "friction", or "culmination"; he is very familiar with these concepts and explicitly demonstrated their role in combat. This campaign and battle could serve as a textbook study of all three Clauswitzian ideas. Despite the fact this army was so thoroughly destroyed in an action far from home that most of its official records were lost with it, the author has managed to fit together the bits and pieces of evidence found in a multitude of memoirs written by eye-witnesses and participants to form a remarkably vivid and comprehensive account. He has a novelist's way with graphic language. The Swedish battalions form up in column, force their way at dawn through the outer line of Russian redoubts while taking horrendous casualties, march to and fro for several hours on the western extremity of the battlefield while the generals debate, and then turn to face a massive foe. Englund reckons the combined total losses on both sides of the regular troops in dead at 8,300 men - 6,900 Swedes and 1,345 Russians. To this he adds on the Swedish side possibly 1,500 wounded who made it off the battlefield and 2,800 prisoners on it. Not counting the wounded this gives 9,700 out of 19,700 engaged or 49 percent. This is an incredible loss for a few hours (actually minutes) combat and especially a striking disproportion compared to usual statistics between dead and wounded. Englund draws the conclusion that a large number of Swedes, initially wounded, were massacred on the battlefield later. Reading the minute by minute description of the combat actions of each Swedish regiment, however, one is left to wonder how anyone at all escaped with his life. In style the book reminds of the writing of Robert Woodward and Rick Atkeson on Desert Storm or the development of policy in the White House. That is, it seems to be based on extensive interviews with the participants of all ranks conducted immediately after the events. Of course it is not, but the author has done an extraordinary job of putting life into obscure and musty diaries. "Rehnskold had only parted from Lewenhaupt a moment after their latest altercation, when he turned back. He had made his decision. He seems to have been conscious of his own surly humor and now made an effort to show a more amiable side. He grasped the general by the hand and said: 'Count Leijonhufvud, ye must go and attack the enemy. Act now as an honest man in the service of His Majesty, we will now unite in friendship and brotherhood together.' The prickly Lewenhaupt was surprised by this civility, and had time to reflect suspiciously that it originated from a mounting lack of confidence in victory." It is only with later reflection that the reader stops to ask, "Wait a second, How could anyone know all this?" It seems he has, in effect, "interviewed" these contemporary writings, asking questions as he might of the authors and connecting their letters into extended answers. Of course his task is made easier by the custom of the times, an era in which writing letters, diaries, and memoirs was still a widely practiced art. As the occasion presents itself, the author offers wideranging commentary, opinion, and exegesis comparing or contrasting a Carolinian practice, condition, or belief with its medieval or modern counterpart. This reviewer considers himself something of a "nit-picker" when considering such generalizations, which for some other authors can assume grandiose proportions (and pretensions). In the present instance, however, he was unable to turn up anything to quibble about. The author has a wide ranging knowledge of society as well as military affairs from medieval times to the present and selects his examples carefully. At every turn Englund's grasp of the niceties of 17th - 18th century military affairs from camp life to tactics is exact. Students of military history of the period will want to study this book in conjunction with Brent Nosworthy's The Anatomy of Victory, which, while being the most detailed recent study of tactics in this period, does not include Swedish and Russian practice. The book is not organized in explicit, long sections by military functions (logistics, weapons, tactics, etc), but extensive reporting on all of these is worked into the relentless, building narrative of events at precisely the right point, when knowledge of the topic is essential to understand what is going on. The scenes from the camps illustrate how significant this aspect of military life is for the final outcome, even though only a minuscule percentage of time in a campaign is actually spent in combat. One sees that, operating over months and years of field campaigning, sexual deprivation can have psychological effects as powerful as do enemy bullets in a few moments of battle. Englund has an uncanny way of inserting his digressions into broader cultural and political issues into the tension packed narrative without missing a forward stride. Here in the midst of the height of the battle he wants to emphasize the psychological importance of the unit standards because he is narrating a suicidal cavalry charge by the Skane Dragoons to recover one of their guidons, while all about them are fleeing. "Banners and standards were important in several ways. They provided direction for the troops and kept them collected in battle."... [He continues with a paragraph on the technical aspects, but then observes]. "Thus they were quits for their own recent loss. The episode exemplifies the dueling elements in the battle..."
The reader is likely to be so wrapped up in the flow of the battle that he might pass right over this kind of detailed information. And after several paragraphs filled with more ancillary detail we learn that the Skanians along with their neighbors, the Ostgota cavalry, were ultimately barely able to fight their way through yet another encirclement of Cossacks, Kalmucks and Tatars supported by artillery. One rarely hears mention elsewhere of the role of Kalmucks and Tatars in the Russian army of the 18th century. The author's extensive knowledge of the Russian side is evident in the detailed information he provides when it suits his purpose. "The Russian artillery fell silent. The heavier pieces, 40-pounder howitzers and mortars, and 20-pounder mortars, had on average delivered 17 or 18 rounds apiece. the average of the eight-pounder cannon was 12. In spite of their lower rate of fire, the long-distance 12pounders had fired off an average of between 36 and 37 rounds..... [the regimental three-pounder cannon in Hallart's division fired] an average of over 42 rounds per barrel." But these statistics and many more are provided to illustrate the firestorm into which the Swedish troops had plunged, not as a basis for any discussion or analysis of the Russian artillery. Englund renders his summary of the larger influence of the battle in his Epilogue, which is characteristicly built around the individual survivors. "The few who came back found an altered Sweden. The land they had left long before had been a great power, one of the mightiest in Europe. The land they returned to was crippled and defeated, and had reverted to the secondary rank it once had held." "The battle of Poltava, and the ensuing surrender, marked an irrevocable turning-point in the war. When the long-delayed peace was finally concluded it signalled the end of the Swedish imperium." The eight maps are exemplary in their precision and clear detail. They include two on preliminary background, four on phases of the battle and two on the aftermath (retreat). The translator has provided a fine, much appreciated Biographical Appendix to give the general reader some sense of who the multitude of figures were. This is drawn from Adam Lewenhaupt's Karl XII:s Officerare, and a basic Swedish dictionary of biography, Svenska Man och Kvinnor. It seems that Englund managed to incorporate the name of every individual Swedish soldier for whom he had any specific information at some point or other in the narrative. The book must be a best-seller alone on the strength of providing a "now you can learn what your great-xxxx-grand father did in 1709 for every Swedish family. The index is almost entirely composed of proper names. One wishes the many functional topics and concepts that are buried within the narrative had been included for ease of reference. Having finished the book, one recalls having seen mention of all sorts of statistics, facts about daily living, religious practices, cultural preferences, and comparisons between medieval, 18th century, and modern practices or beliefs, but it will take another treasure hunt of skimming through page after page to find the choice passages. The wise reader will take notes during the first reading. We provide Beskrovni's map of the battle here. There are no illustrations and there is little discussion of look of the uniforms, weapons, and accoutrements to aid in a visual sense of the armies involved. There are many books in Russian, but these are generally difficult to obtain, apart from one recent issue of the new journal, OREL, published in St. Petersburg. The following sources will partially fill this gap. Aberg, Alf and Gote Goransson, Karoliner, Forlags AB Wiken, 1991. This is a functional study of the Swedish army of Charles XII with only a couple pages devoted to Poltava battle. It is filled with gorgeous color illustrations, diagrams of tactical evolutions, detailed studies of weapons and their use, and evocative paintings of army life. Konstam, Angus, Peter the Great's Army 1: Infantry and 2. Cavalry, Osprey Books, 1993. Konstam, Angus, Poltava 1709, Osprey Books, 1994. These are the only English language references that provide color illustrations on the Russian army in this campaign. Schorr, Dan, Swedish Colors and Standards of the Great Northern War, Editions Brokaw, 1987. A useful pamphlet with black & white illustrations. Schorr, Dan, The Saxon Polish Army During the Great Northern War, Editions Brokaw, 1987. 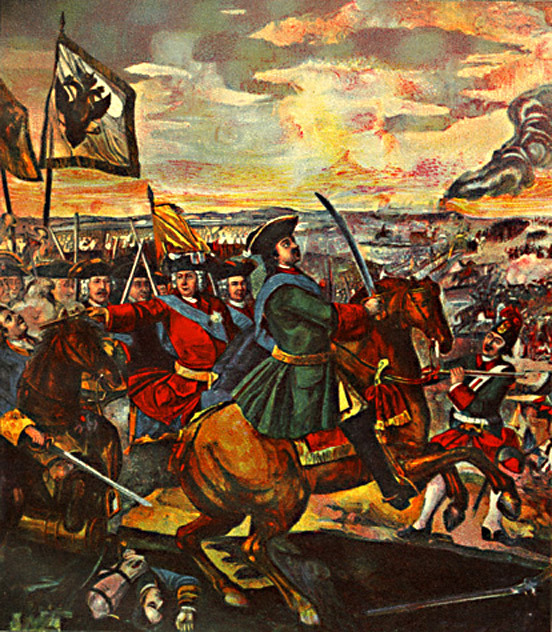 The army Charles eliminated prior to Poltava. Condray, Pat, Swedish and Russian Armies of the Great Northern War, Editions Brokaw, 1990. A booklet containing information on uniforms and standards. Duffy, Charles, Russia's Military Way to the West,London, 1981. Former lecturer in military history at Sandhurst and prolific author on 17th century military history. Hatton, R. M, Charles XII of Sweden,London, 1968. The best biography of Charles XII. Massie, R. K, Peter the Great, London, 1981. A highly recommended biography. We are preparing a full account of the Great Northern War and a partial translation of Telpukovski's book on the war . We have the Encyclopedia Britannica article on Charles XII. For further material on military history please go to Xenophon.